When visiting Cape Town you can't help but always be aware of the presence of Table Mountain. 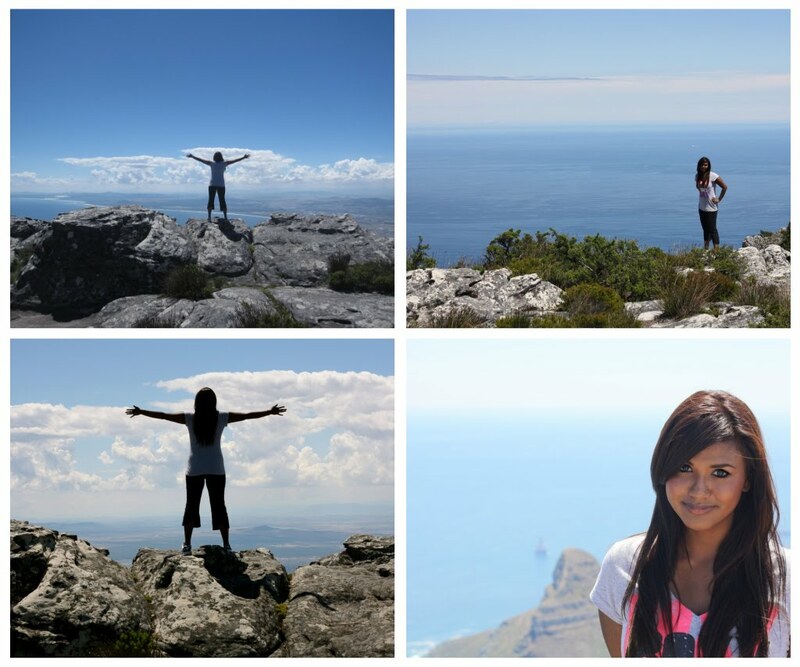 It would be a real shame if you visited Cape Town and missed the views from the top. 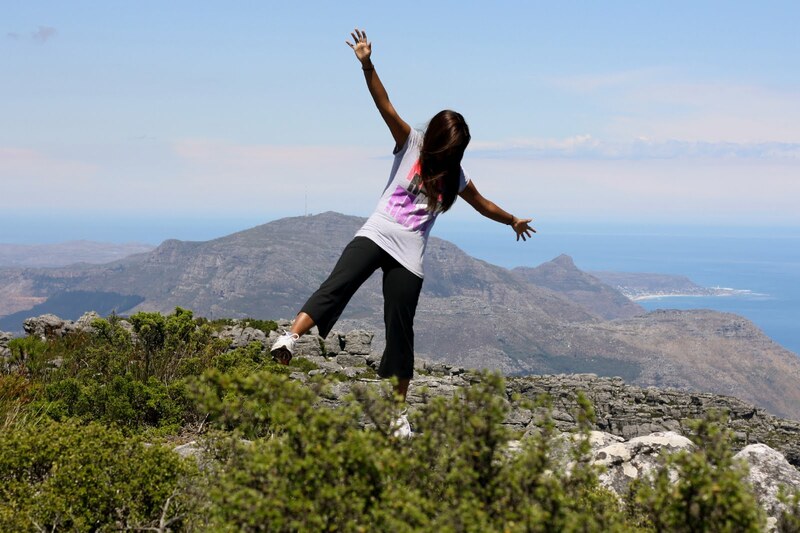 Adventurous visitors can opt for the scenic hike to the top of the mountain. 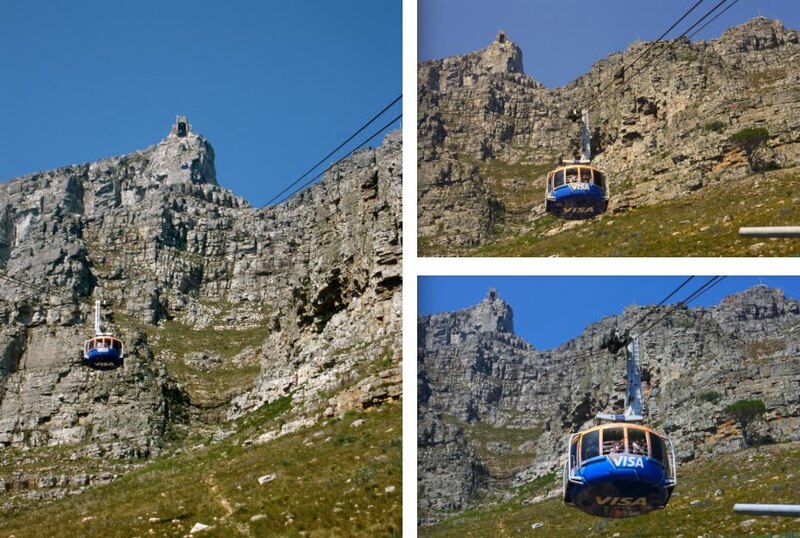 That day, we didn't have 2 hours to spare, so we chose to use the cableway to get to the summit. The short ride features a rotating platform inside the cable car allowing all the passengers to get a full view. One you've reached the top, you can't help but be stunned by the panoramic views of the ocean, city, coast-line, and mountains. 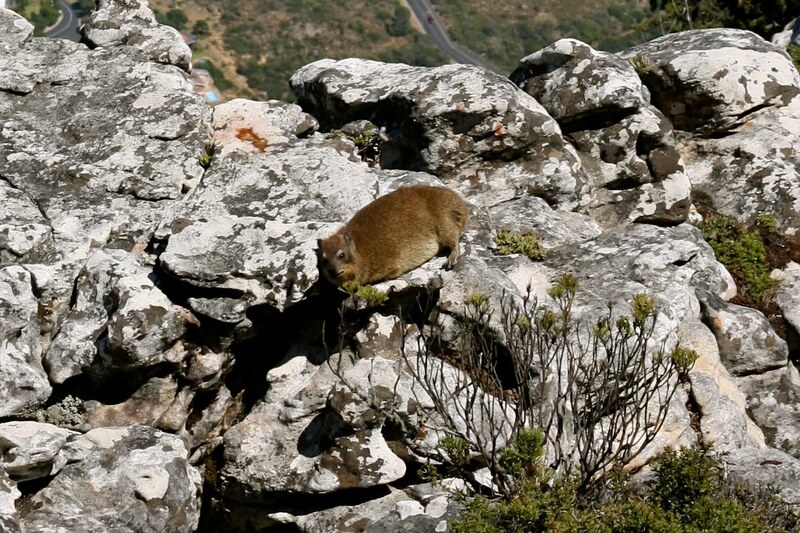 There isn't a lot of wildlife to see (lions on the mountain were hunted to extinction 200 years ago) but every tourist is likely to spot at least one dassie. Dassies, or Rock Hyrax's, are small guinea pig-type animals that are (counter-intuitively) related to elephants. You wouldn't know from seeing them, but apparently they share a lot of common traits (although at an obviously, smaller scale). We saw a few hiding on an outcrop, but that was our only sighting. 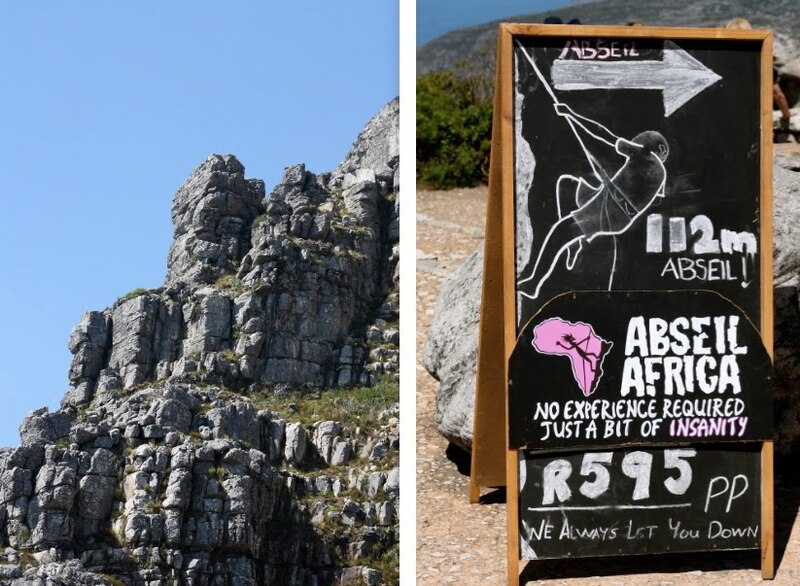 After running out of water, we figured we would have to pay an exorbitant amount to get some at the Table Mountain Café . The prices were actually quite reasonable, considering it was at the top of a popular tourist destination. So, we decided to stay for lunch. Mina tried the snoek fish, after hearing that it is a very common Cape Town meal. She described it as "disgusting". She said it was very bony and would most likely be better as a paté (which is how many do eat it, due to said boniness). We're not rushing off to try the fish paté anytime soon. After a bit more wandering, we reluctantly took the cable car back down, having thoroughly enjoyed our afternoon on Table Mountain. ya'll are just too CUTE! are you still in Philly? Ok. I want to go now. Views like that are why I love hiking in mountains. Great pictures...they make me very excited to visit! Our plan is to head to South Africa in early June right before the World Cup. so rad! i love your excursions! Beautiful shots. A friend of mine had an artist's residency on Robben Island, but I had no idea it was so close to the shore. No abseiling down for you two adventurers? 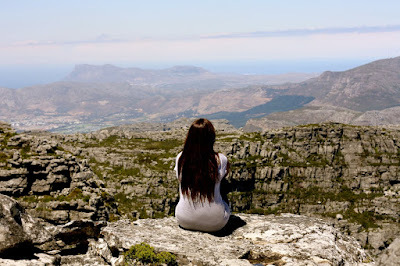 One question for Mina: girlfren, how does your hair always look so good *even when you are on top of blustery Table Mountain* and spying on hydraxes? Seriously. Holy Cow! Gorgeous photos! And gorgeous you! You look stunning! What is that rodent like creature? Kinda creepy. But the view, that is spectacular. 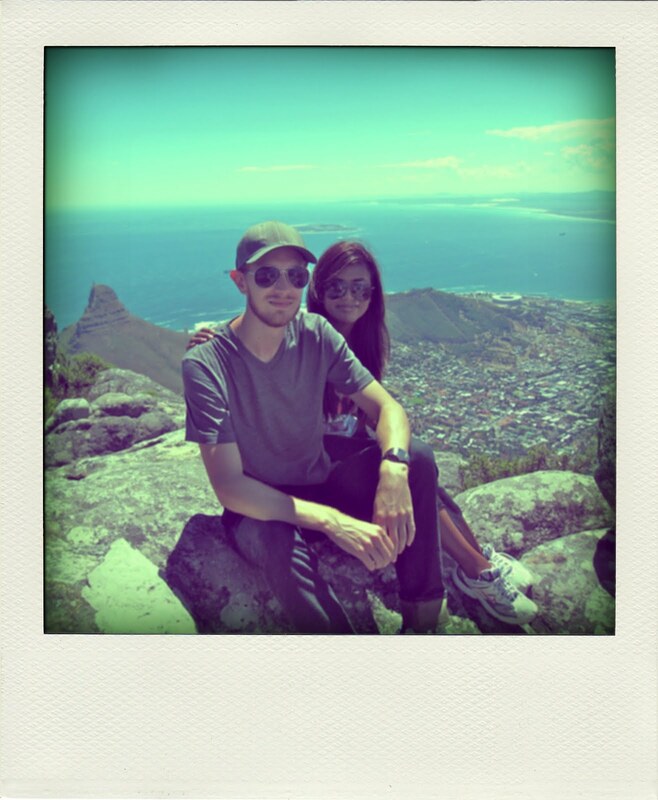 Great pics- I love following you two on your honeymoon! OMG, I am scared of heights. thoroughly enjoying the photography on this site! Mina your so pretty! This adventure looks breathtaking! Great photos! I hate dislike fish because of the bones, creeps me out! It sounds like you have an amazing life! This looks like an incredible place to see. Whoa. I just found out about your blog. It is absolutely admirable of you two to just leave everything and start an adventure! It is my ultimate life goal to travel around and experience different cultures. It must be scary at first, but I am sure that it is an experience that you will never forget. thank you for stopping by my page! target always seems to be out of my size by the time i get there. you have a great blog, it's awesome that you get to travel so much! How close to the edge are you in those photos? Are the images just misleading based on where you're standing/sitting, or are you actually right at the edge? Also, although I said I would try to stop with the saracastic comments, guess what? I just learned, from the above comment, that you guys are using a Polaroid! OMG BBQ! A POLAROID! Of course you decided to bring a large, obsolete camera that they stopped making film for on a round-the-world trip! I've never heard of anything like a computer, which may be able to give non-Polaroid photos the appearance of being Polaroids for aesthetic purposes on a blog! I have no idea how that thing that looks like a squirrel without a tail could possibly be related to an elephant. Africa is crazy. Gorgeous pictures!! You are so pretty!! I LOVE the way you ended this post!!! Fantastic photos. Btw, it takes a lot longer than 2 hours to hike to the top, haha. It took me and my friend closer to 4 and we're both pretty athletic. It was an AWESOME hike though!